It is not cost-effective to buy a costly professional video editor if you only want to cut a few seconds out of a video. At this time, you can use a simple and free video cutter like Moo0 Video Cutter to trim videos. 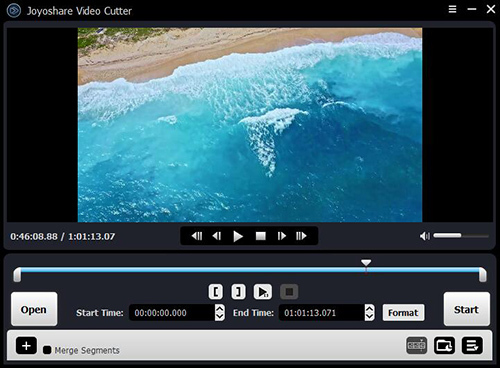 Moo0 Video Cutter is one of the fastest and lossless video trimmers that can help cut a portion of video from video data in various formats such as MP4, AVI, M4V, FLV, MOV, MKV, OGG, MPG, WMV, OGV, TS, TP, WEBM and many more. However, this program also has its disadvantages. Sometimes it may fail to save the audio data and it only runs on Windows computer and is not compatible with macOS system. Therefore, we’re going to introduce 5 best alternatives to Moo0 Video Cutter, so you can get one to meet your needs better. Joyoshare Media Cutter is absolutely the top-ranked one among a large number of available Moo0 Video Cutter alternatives in the market. It enables users to cut, split and trim videos with 100% original video quality retained at 60X faster speed owing to its built-in powerful acceleration processor. Joyoshare Media Cutter supports a wide range of media formats including M4V, MP4, MOV, M4R, MP3, AU, AVI, OGG, MPEG, 3GP, WMV, ASF, FLV, etc., as well as various output devices like iPhone, Galaxy S8, PSP, Xbox 360, Samsung TV and many others. 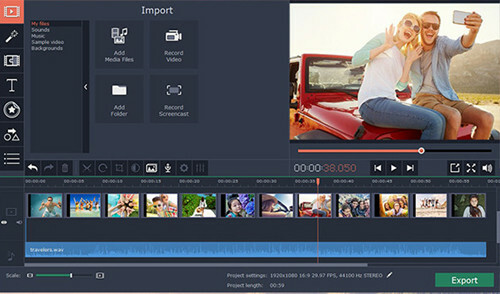 Additionally, Joyoshare Media Cutter contains other excellent video editing features such as adding watermarks and subtitles, rotating the videos, adjust the video's contrast, brightness, saturation and hue, etc. You can change the codec, resolution, sample rate and bit rate, etc. according to your needs. As a free video cutter, Gihosoft Free Video Cutter is a pretty good alternative to Moo0 Video Cutter. This simple video cutter software allows you to cut out a clip from a large video without quality loss in a few clicks. You only need to add target video file, set duration for trimming and then save it as a new video, that's it. 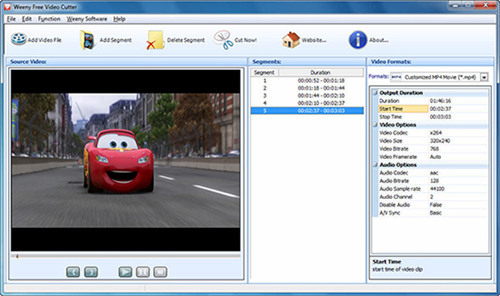 Any formats like MP4, AVI, VOB, MPEG, MPG, MOV, WMV, RM, ASF, 3GP, MKV, FLV, DVD can be supported by this video clipper. Weeny Free Video Cutter is another video cutting freeware that can split large videos into smaller pieces, remove the unnecessary parts such as advertisements, trailer or outtakes, etc. 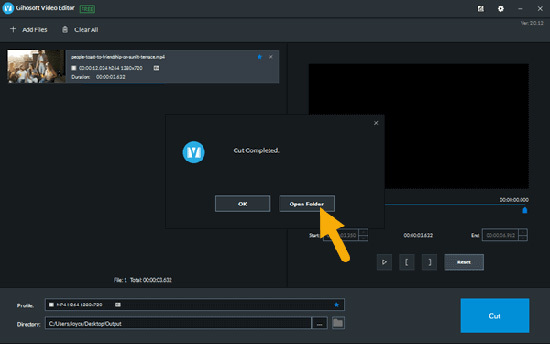 You can also customize the output settings like codec, frame rate, bit rate, video size and quality, etc, and then share the polished video to video website such as YouTube, or back up it to online storage service like RapidShare. Weeny Free Video Cutter empowers you to trim video files from 3GP, AVI, FLV, MP4, ASF, MPG, VOB, WMV, RM, RMVB and more others to MP4, 3GP, WMV, AVI, FLV or MPG files. Available for Mac and Windows, Movavi Video Editor is a useful replacement if you're looking for Moo0 Video Cutter alternatives. Users can adopt it to cut a long video into shorter ones, slice off unwanted portion with a couple of steps. Powerful as it is, you can also edit the video clips, audio and images, apply special effects, and embed titles, callouts, filters and transitions. Afterwards, you can export your video in various popular formats such as MP4, AVI, WMV, MPEG, MOV and FLV. 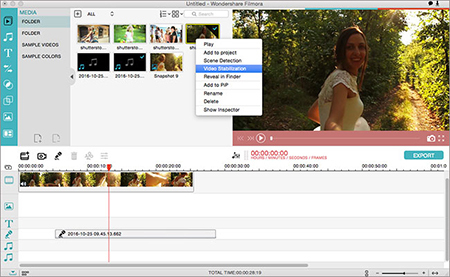 This is a famous video editing tool, and thus can also be a competitive Moo0 Video Cutter alternative. Filmora Video Editor gives you freedom to do not only the basic cutting, trimming, splitting or joining, but also more advanced video editing tools such as picture in picture, audio mixer, text editing, special effects, filters and overlays. It offers you an Effects Store, where you can apply hundreds of different filters, video effects, animated eletects you desire. Now you know these top-rated alternatives to Moo0 Video Cutter, with features, pros and cons of each program described above. If you're still seeking for a free one, you can choose Weeny Free Video Cutter or Gihosoft Free Video Cutter, yet they support limited video formats and have no video editing function. If you want to cut and edit video more flexibly, you can take Movavi Video Editor and Filmora Video Editor into consideration. But if you think the video quality is an important factor, Joyoshare Media Cutter will be the best choice, which will cut video and audios in lossless quality.